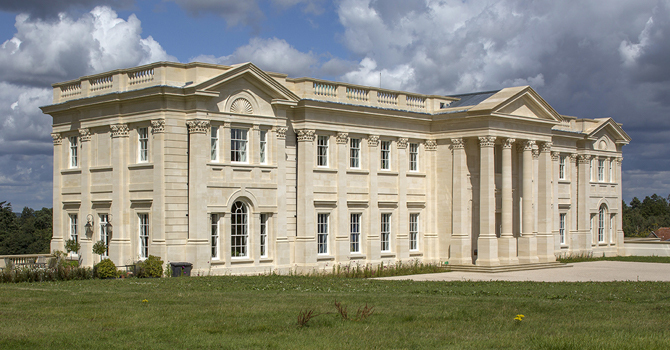 The design for the replacement house in Surrey restored the structure of the estate, reinstating a central focus on the site of the original mansion, which was destroyed by fire in 1953. The new house obtained planning permission under the old country house policy known as ‘Gummer’s Law’, PPG7, and is designed in direct response to the landscape. The central volume on the lakeside elevation reinforces the original approach to the estate and links the house to the grounds. The giant, Corinthian order and pedimented portico give an effect of monumentality and emphasise the double height of the entrance hall within. In contrast, the west elevation expresses its function as a picturesque garden façade, with extensive areas of glazing and a rusticated lower-ground floor. The design restores the English country house tradition to this important site. John Sheehan (Oxford) Ltd carried out all of the sub-structure and super-substructure work.